For purposes of this study, page numbers refer to the placement of text according to this epub with images copy of Anne of Green Gables from Project Gutenberg. One of the important devices writers use in literature is that of pacing—to deliver the story according to a perceived timing of the sequence of events 1. The pacing of a story affects the tone of the work by suggesting to the reader that a scene is attached to a certain feeling. Whether it progresses quickly to suggest an action-packed event, or slowly to suggest the seriousness of a scene, pacing allows the reader to live the story through various ups and downs, much like real life. To demonstrate the effectiveness of pacing, I will take a look at ‘Anne of Green Gables’ by L.M Montgomery for how she utilises the device throughout her story. Specifically, I will look at how she delivers the illusion of pacing to keep the story flowing despite its slow progression of the plot. The story follows the life and adventures of an orphan girl, Anne, and her new life at an estate called Green Gables. The characters in this book are very well developed and, while it isn’t one I particularly enjoyed reading for personal preference, the plot is solid and complete with character arcs. Nevertheless, a writer can always learn something from other writers. The pacing Montgomery uses is subtle at first read. Such is the deception of the illusion she uses throughout the narrative. Jumping in to dissect the story, the progression of the plot itself is noticeably slow. Despite the many scenes that occur through the story, the time it takes for the reader to navigate from one scene to the next is stretched out. Montgomery uses characterisation to fill in the time gaps between scenes. This is the illusion of pacing she works into the story to manipulate the timing perception of the reader. Much like a stage magician distracts with one hand to pull off a trick using his other, Montgomery distracts from the plot by getting the reader invested in the character Anne and her vivid and wild imaginings that take place frequently. In using a lot of description in her opening chapter, Montgomery establishes the general pacing of the book by mixing action and suspense to keep the reader curious and invested in the story. This established pace right in the opening sets up the perception from the beginning and that perception becomes expectation for the reader. Once the first sequence of suspense reaches its climax, Montgomery introduces the reader to the whimsy of the character Anne. From the moment Anne meets with Matthew Cuthbert, her adoptive father, the nature of her character is revealed. At first, Montgomery holds back, as fitting with the character, to ease the reader into the persona Anne has. This introduction is done with fears of abandonment and quickly consolidated with the relief to the contrary. The emotion Anne shows through her dialogue on page 11 makes her resonate with most readers, which opens the potential for the reader to attach themselves to her. “Why, a bride, of course—a bride all in white with a lovely misty veil. I’ve never seen one, but I can imagine what she would look like. Shortly after, Montgomery introduces the reader to the fleeting imagination of Anna on page 12, wasting no time in establishing the sort of person the character is. The large amount of dialogue showing Anne’s imaginings begins to distract the reader from the plot. By vivid imagery and thoughts, the reader is taken to a fantasy world within the mind of the character. Through this escape from reality of both Anne and the reader, the pacing perceived and established in the beginning is maintained although the plot itself stagnates. From page 12 through to the end of the chapter on page 18, Montgomery affirms the characters Anna and Matthew along with the development of their interpersonal relationship. From the opening line to page 11, several events occur to progress the plot, but on pages 12 to 18 there is no plot progression aside from the journey toward the setting’s location: Green Gables. This method of distraction is used throughout the book, most prominently in scenes where the characters move through the world. In my focus for the study on pacing in Anne of Green Gables, I turn attention to the world-building Montgomery has and how it comes into play with the pacing. With only the imaginings of Anne’s dialogue, the illusion of pace would be far too quick for what was established in the opening and what the reader expects. To remedy this, Montgomery uses world-building in between the dialogue to slow down the pacing. Her technique of using world-building to affect pace further grounds the illusion of a steady pacing of the story as set from the opening chapter. The manner in which Montgomery presents her world-building is precise. She includes parts of it only when it matches and is relevant to Anne’s dialogue or to give the suggestion of movement of the characters in the world. By including the world-building in this way Montgomery keeps from further distracting the reader, which would break the illusion of pacing that both the dialogue and world-building maintain. the story never loses momentum or becomes dull. Anne of Green Gables is a story planned around the focus of the reader, using complex characters, character arcs, and precision pacing to fulfil the purpose of entertainment. Without the illusion of pacing Montgomery employs through Anne’s imagination and the world-building, the plot would fall flat and lose the reader’s interest. Montgomery has constructed the scenes in such a way that compensates just enough for the stagnating plot to distract the reader and keep us unaware—at least initially—of the change in pacing. For purposes of this article, the page numbers referenced correspond with those of the ePub (without images) obtained from Project Gutenberg’s library. Within many works of literature, social critique is prominently on display under the medium of storytelling. 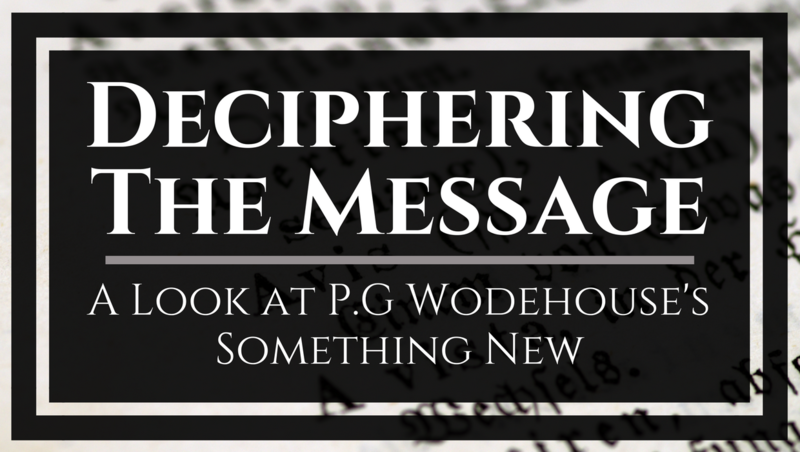 P.G Wodehouse’s Something New is one such work and the focus of this review. Through analysing the book, I take a look at how the critique is implemented into the narrative and delivered in a manner that did not detract from the story itself—lending an added emphasis to the events of the plot that occurred. For the “message” of any medium or technology is the change of scale or pace or pattern that it introduces into human affairs. In the case of Something New, the medium is literature, as conveyed through comedy—in the form of satire. This medium focuses on the message of critique of the socio-economic status of the early 20th Century across two countries: the United States of America and the United Kingdom. It delivers the critique through perspectives of the upper, middle, and lower classes. For this review, I focus on the views each class had in regard to the others. This focus also looks at their perspective toward the current state of socio-economic status, life, and the world. I consider this perspective and the critique Wodehouse delivered in the book by showing the views of each class toward the others as well as the views on women at that time (in the 1910s when the book was written). Throughout the book, the reader is exposed to various perspectives concerning the Other, and these views show a clear distinction of socio-economic classes—the distinction being prominent in the USA and UK during the 1910s and continuing through both World Wars as a strong remnant of the Industrial Revolution. Despite the average man he seems to see himself as—ignoring any privilege that afforded him this view—Lord Emsworth thinks himself as humbled by his content life. He struggles to fathom the need for the worry he acknowledges the rest of the world has. From his perspective, life is an unnecessarily worrying world and he considers himself spared from trivial matters and disappointment—spared from the rat race of the rest of the population. Wodehouse spares no subtlety in critique on the upper class throughout Something New, showing their disregard for the life of the Other. The perspectives of the Honourable Freddie (Lord Emsworth’s younger son) and Mr. Peters (prospective father-in-law to the Earl’s younger son, Freddie) are of a similar nature. Ashe Marson views the lower class as creatures that reside in the shadows and metaphoric sewers of London. He sees himself as above them. Marson shows some form of sympathy toward the lower classes, but only to distinguish himself from them. Through his apparent sympathy he sees them not as people, but as entities unlike himself and those of his status. Later in the story, Ashe Marson ignores the existence of the lowest of the lower class and the plights of those in poverty. He also regards himself as among the members of the lower class, while maintaining a distinction between himself and those of lower socio-economic status. This distinction is a separation of the Self from the Other. This disdained and disassociated view of the lower class is continued through the perspective of Joan Valentine, while also displaying her view of the upper class activities as trivial and materialistic. Unlike the other characters mentioned, Mr. Adams only features in one scene in the book. This scene, while establishing Lord Emsworth’s character and setting up his present frame of mind, focuses on the character of Adams. His appearance in the story is restricted, not developing further like the other characters. Adams’s inclusion in the story is a means through which Wodehouse displays the order of society to further critique the classes and their perspectives. You would never have thought it, to look at him when engaged in his professional duties, but Adams had built up a substantial reputation as a humorist in his circle by his imitations of certain members of the club… The Earl of Emsworth ambled benevolently to the door, leaving Adams with the feeling that his day had been well-spent. He gazed almost with reverence after the slow-moving figure. Mr. Adams takes to mockery of the members of the upper class—his position as steward at a club for the senior members of the class affording him the material with which to indulge in the mockery. His mockery is a means of entertaining himself and those around him. In regard to the upper class life, Adams displays contempt and disassociation from himself—and those who share his status—for the members of a higher status. All through Something New, this mockery of the upper and middle classes is presented through the perspectives of the characters situated in the lower class, particularly among the servants of the upper class. Wodehouse alludes to several forms of critique of social issues, ranging from sensitive topics to the more commonplace daily life troubles. Through these comments, he shows the differences and similarities of views and habits across socio-economic status. After looking at the critique of the classes, I explore two other observations in the book and consider the medium of this delivery and the effect the manner of the deliver has on the message of the book. Sexism and the oppression of women in the socio-economic classes remain a prominent issue, though less obvious with class distinction today than in the early 20th Century. Throughout Something New, Wodehouse presents the reader with blatant sexism through dialogue of his characters, representing views of people in that time to deliver his critique on oppression. This is especially noteworthy as the book was written in a time when women’s rights were being fought for on a large scale. Without quoting a significant portion of the book, I narrow the argument to two quotes that best display the sexism Wodehouse perceived and criticised. This is a narrative by George Emerson, a middle class lawyer, to Aline Peters during his attempts to court her. The dialogue highlights the views of men concerning women and their idea of a woman’s role and purpose in life as that of servitude to the male portion of society. Wodehouse further remarks on this through Aline’s thoughts on George’s attitude and again on a general critique of the “superman” mentality of young men, which can be seen in the following quote. The quote above is a recollection of a conversation from Lord Emsworth with another of the upper class about the movement toward establishing voting rights for women. The disdain of the thought that women would be able to vote was shared by Lord Emsworth. In using this narrative, Wodehouse comments on the inconsideration of the Other—in this case being women—through the lack of acknowledgement toward the struggles women endure within society. Something New, as the book is named in its first publishing, delivers critique through the text using the medium of humour to mask it. This medium allows the reader to absorb the critique—the message—without triggering a defence mechanism that may lay dormant and waiting to protect a person’s worldview. Wodehouse executes this mission with intentional precision in his writing. Expanding on the critique through humour, Wodehouse’s title bears a greater impact within the body of the work. The plot in Something New circles along the trivial pursuits of the characters, which brings them together for the climax of the story. In the pursuit of wanting something new, something fresh, the characters engage in unspoken rivalries, social form, and competition to achieve their desires. When the story comes to a resolution, the characters settle into the stagnation and repetition of life, but with less contempt for the ordinary that seemed to plague them before. This contradiction with the title is further emphasised through the recurrence of the title within the narrative, providing a subtle reminder to the reader of the goal of the characters and the pursuit of it as the plot progresses. The title Something New appears on pages 10 and 11 with the discussion between Ashe Marson and Joan Valentine about the mundanes of life. The conversation is mentioned again on page 62 at the climax of the story when the former desire for something new has come to realisation. On page 42, where the title appears again, Lord Emsworth discovers in his pocket the object that is the main drive of the plot and the events within. This appearance serves further to highlight both the character’s present condition and the otherwise dull happenings of his daily life. In the course of the plot, and through the events that occur to the characters, something new is presented that changes their situation at that moment. And yet, what appears to be change isn’t anything new after all. P.G Wodehouse utilises the medium of humour as a means to deliver the message to introduce awareness of issues within society. While the topics within Something New are still an issue today, the division between upper and lower classes was far more distinctive in the book, and the burden of both classes rested upon the middle class. By ignoring the upper class and placing more strain on the lower, the class gap is driven further apart. As shown through Wodehouse’s delivery, social critique is best delivered subtly in the medium. The subtle delivery puts less focus on the message and, instead, uses the medium to carry the message through the work. This method allows the reader to think about the issues without forcing them to have an immediate opinion that would cause them to become defensive and potentially block out the message.